Brian Segars' whimsical design celebrates letting our imagination take flight with a good book. A good book lets your imagination take flight. 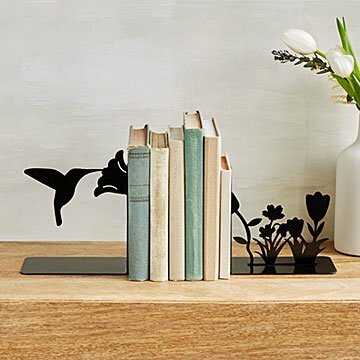 Brian Segars' whimsical bookends celebrate that special experience, capturing the silhouette of a fluttering hummingbird. Hand cut from carbon steel, the set is a great gift for the book lover who prefers to read in her secret garden. Handmade in Kentucky. A nice gift for a bookworm. They look lovely. Great piece for organizing books! Unique and gives a lively, attractive quality to any room.